Carpet Bags from MADE OF CARPET® - genuine English heritage and Renaissance of the Victorian fashion. 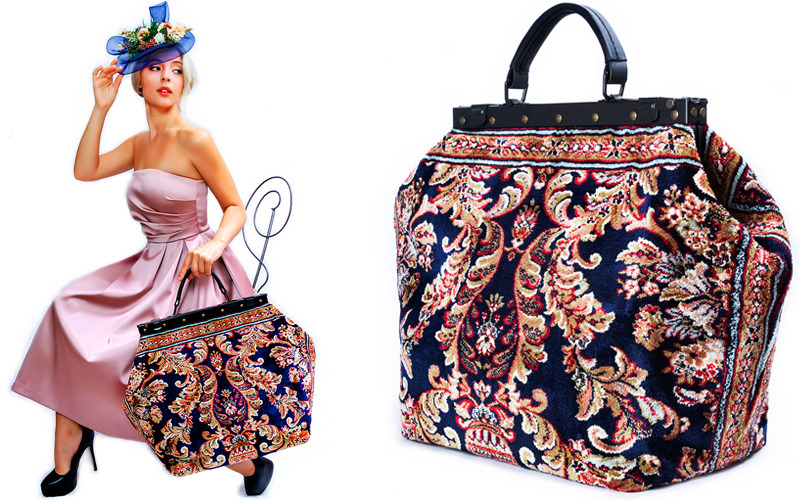 The idea of these beautiful unique Carpet Bags has been inspired by by such famous English literary characters as Mary Poppins and Miss Marple. Our bags are designed in London and handmade in Europe out of the finest quality thick rugs woven in Western Europe and bespoke trimmings, made exclusively for us. We have closely examined all possible modern materials and technologies, and have found those that meet a performance capability of modern machinery, all high quality requirements of the real Victorian Carpet bags and modern health and safety standards. Our carpets are rainproof, plushy, soft, light and silky, but quite thick and firm at the same time that makes bags look and feel full bodied, strong and durable. These efforts have not gone unrecognised. We were finalists at Drapers Digital festival Award, Drapers Footwear and Accessories Award, British Travelgoods, Handbags and Accessory Association Fashion Accessory of the Year Award and British Top Designer Competition. Perhaps you have seen our bags on TV - they were featured in the TV series Ripper Street (Season 2, episode 3 “Became Man”). Among our customers are many highly recognisable names - former Lord Mayor Dame Fiona Woolf, Bony M singer Sheyla Bonnick, TV presenters Ashley James and Sandi Bogle and others.